For patients with recurrent primary spontaneous pneumothorax, surgery has been thought to be an acceptable treatment. However, even if bulla is completely resected, postoperative recurrence is relatively common due to bulla neogenesis. Bulla neogenesis seems to develop naturally in younger patients compared with the elderly, as theorized till date. If the complete development of bulla neogenesis is confirmed, surgical resection can be performed as the radical treatment. Then, we evaluated the relationship between bulla neogenesis and age. Between February 2009 and July 2018, we consecutively enrolled 276 patients who underwent primary bullectomy for primary spontaneous pneumothorax in our hospital. 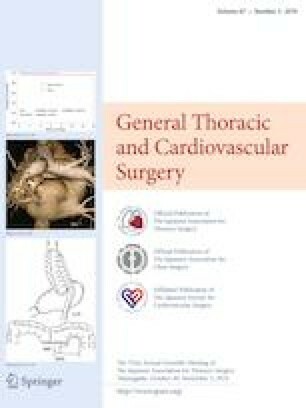 Finally, high-resolution computed tomography findings/observations of 155 eligible patients were evaluated retrospectively. The relationship between bulla neogenesis and age was evaluated using univariate and multivariate analyses and an inverse probability of treatment-weighted method using the propensity score. The study included 58 patients aged < 20 years and 97 aged ≥ 20 years. Bulla neogenesis was present in 34 patients (21.9%). Bulla neogenesis developed significantly at age < 20 compared with age ≥ 20 (44.8 vs. 8.2%). Univariate and multivariate analyses showed that age < 20 years was a significant factor associated with bulla neogenesis (P < 0.001 and P = 0.018, respectively). The inverse probability of treatment-weighted method showed that age < 20 years was a significant factor associated with bulla neogenesis (P = 0.0057, hazard ratio 4.79). Surgical treatment may be delayed in young patients (age < 20 years), because bulla neogenesis is not completely developed by this time for primary spontaneous pneumothorax. The authors thank the staff of the Clinical and Translational Research Center, Kobe University Hospital, for statistical advice.